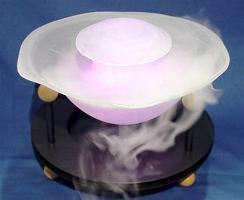 Quartz energy bowl fogger water fountain with color changing LED lights and quartz rocks. It looks hot but feels cool! 11"(W) x 17.5"(H); Including white bowl, metal stand and quartz rocks. This one can be also hung in a room, patio by just removing the bottom metal ring. 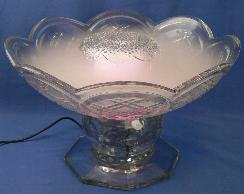 Elegant glass bowl fogger water fountain with LED color changing lights. 13.5"(W) x 8"(H); Including a lotus shape glass bowl, a glass base and a beaded surface glass cover. Great gift for the seasons! 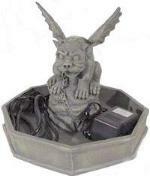 Gargoyle water fountain-water, smoke coming out of his mouth. 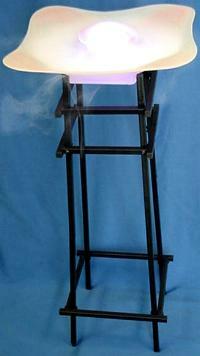 Frosted peach bowl misting fountain with metal floor stand in 33" tall, including fogger and LED color changing lights. Wall fountain with cool white LED light, water are running down from top pot to the 2nd, the 3rd, then fill up a bowl and falling down to the big container, including UL-transformer, speed adjustable water pump and picture frame. Wall fountain with cool white LED light, water are coming out from wall tap, filling up a bowl below, then falling in cascade shape into the bottom big bowl, including UL-transformer, speed adjustable water pump and picture frame. Wall cascade fountain with cool white LED light, falling water are spreading out through diamond shape center piece, creating a beautiful transparent wall waterfalls, including UL-transformer, speed adjustable water pump and picture frame. 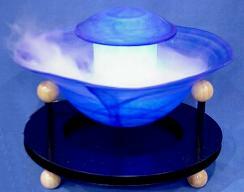 Blue table top lotus bowl fog fountain with a black metal stand. 10.5"(dia)x8"(H); Comes with LED light color/fog output inline and wireless remote controller which allow you to select single light color, changing color and adjust fog output from a remote distance, including a UL-transformer and a special designed water splashing cap holder which shows better light effect and keeps your table dry while you still see heavy mist in the bowl. 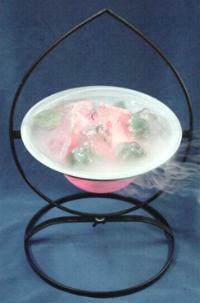 White table top lotus bowl fog fountain with a black metal stand. Item # SFP02: Rolling ball water fountain in white bowl with quartz rock center piece. 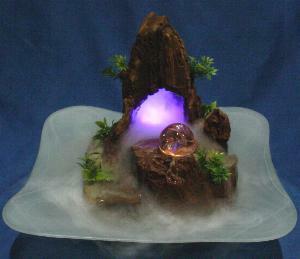 10"(W) x 7"(H); Including a water pump and light, white bowl, glass ball and rocks. Mountain Waterfalls mist fountain with rolling ball. Red-brown mountain. Size:14"x14"(bowl) x 12"(high); Mountain center piece are made with red-brown natural stone, including a frosted white bowl base, a fogger with built in LED auto changing color light, a water pump/light combo and glass rolling ball.